With Game of Thrones making its epic return to the air on April 24th, feverish fandom is at an all-time high. At Brilliant Earth, we are honored to join the International Rescue Committee and HBO in their “Rescue Has No Boundaries” campaign to raise lifesaving support for refugees and uprooted families. Through the Omaze platform, individuals can donate to the IRC for a chance to be flown to LA to mingle with the Game of Thrones cast at the global premiere. 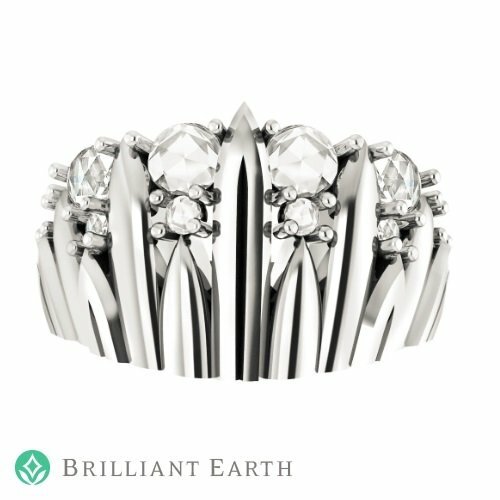 And it’s not just the grand prize winner who scores big; the first people to donate $15,000 or more will win a one-of-a-kind Game of Thrones ring designed by Brilliant Earth. These rings are exclusively available to the first supporters who donate $15,000 or more to the Realm to the Rescue campaign. 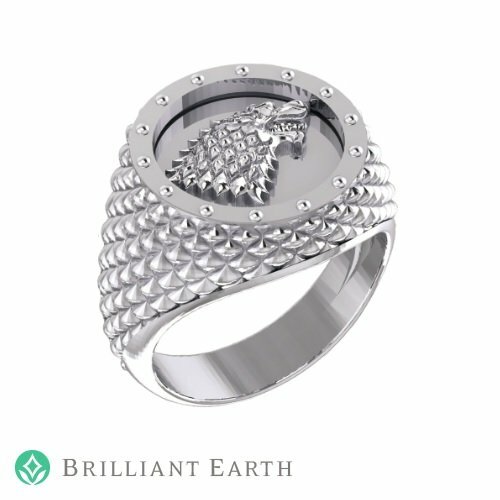 If you’re looking forward to the Game of Thrones season premiere, check out our Game of Thrones ring designs and donate today for a chance to take home one of these exclusive offerings. Wrought in black rhodium plated 14K white gold, this ring captures the essence of the most coveted seat in the seven kingdoms. 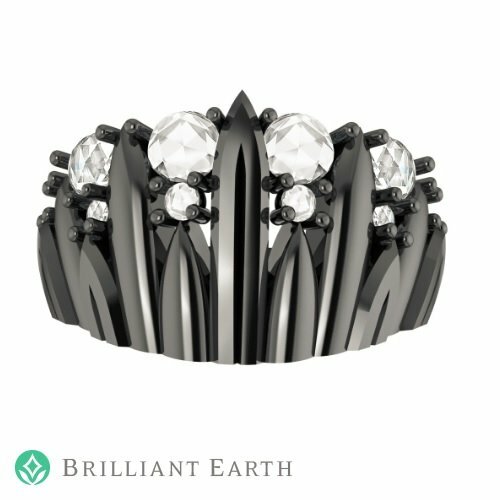 The design includes shimmering rose cut diamond accents to mimic the fan-shaped profile of the Iron Throne, with light streaming through its blades. It is handcrafted from recycled gold and set with ethically sourced diamond accents (approximately ½ ct. tw. ), so there need be no further bloodshed to make it. This Etruscan-inspired 14K yellow gold coin ring showcases one of Daenerys’ golden dragons embellished with three lab ruby accents. 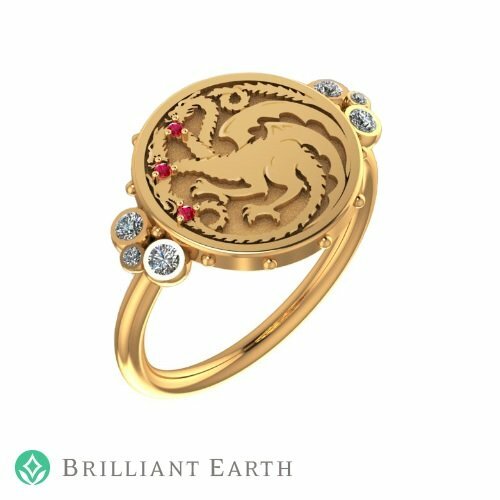 It symbolizes the power and legacy of House Targaryen as well as the currency that rules supreme in the seven kingdoms. Sparkling accent diamonds embrace both sides of the coin for added brilliance. The ring is handcrafted from recycled gold and set with 1mm round lab rubies and ethically sourced diamond accents (approximately 1/10 diamond ct. tw.). This classic signet ring design is inspired by the shields and sigil of House Stark. Artfully carved from recycled 14K white gold, this engraved dire wolf shield serves as a powerful reminder that the Stark family is one of the strongest protectors of the North against the winter that is surely coming. Similar to the black rhodium ring above, this ring is wrought in 14K white gold and captures the essence of the most coveted seat in the seven kingdoms. The design includes shimmering rose cut diamond accents to mimic the fan-shaped profile of the Iron Throne, with light streaming through its blades. It is handcrafted from recycled gold and set with ethically sourced diamond accents weighing approximately ½ ct. tw. To take home one of these exclusive rings, consider contributing to the Rescue Has No Boundaries campaign. Not only will you have the chance to win a trip to the Game of Thrones premiere and take home coveted GoT-themed merchandise, you’ll be helping vulnerable people to survive, recover, and reclaim control of their future. Donate Now.